Mathematics professor Jerry Duncan Taylor passed away in 2013, but his 46 years of teaching lives on at Campbell University in Buies Creek North Carolina just south of Raleigh. 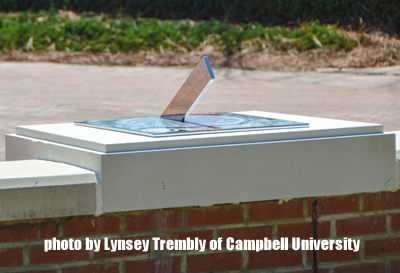 A commemorative sundial in front of Taylor-Bott Rogers Fine Arts Building was dedicated on Wednesday, March 21, 2016. The highly polished dial, approximately 12 inches square, with an inclined bar gnomon sits on a plinth embedded in a low brick wall for all to see. There are time marks for every 10 minutes, with standard time given as Roman numerals and daylight savings time one hour later given in larger Arabic numbers. Professor and mathematics department chair Meredith Williams recalled the start of his teaching career at Campbell: "I'm not sure I would have made it through my first semester without Dr. Taylor. I had an extremely challenging group of students in a class who were determined to see how hard they could push the new professor. Dr. Taylor always had an encouraging word for me before I went to class." Rachel Davis quoted Provost Mark Hammond from the sundial dedication (http://www.campbell.edu/news/item/sundial-dedicated-to-late-math-professor) "We wanted something physical that we could see, celebrate, and reflect on him and the good man that he is and the way he has touched many of the people here... [his] very inspired spouse, Louise Taylor, thought that perhaps we could memorialize Jerry through a sundial. It gives us the time to pause and reflect and think about Jerry." In 2000 the North American Sundial Society held its annual conference in San Francisco and visited the Ingleside Terraces Sundial. A century ago the site was a racetrack and as it turned into a housing development in 1913, a promotion sundial was installed with the advertisement "largest sundial in the world". Michael Callahan of "This Forgotten Day in San Francisco" talks about this historic dial and the developer Joseph A. Leonard of Urban Reality Improvement Company on November 15, 1913. 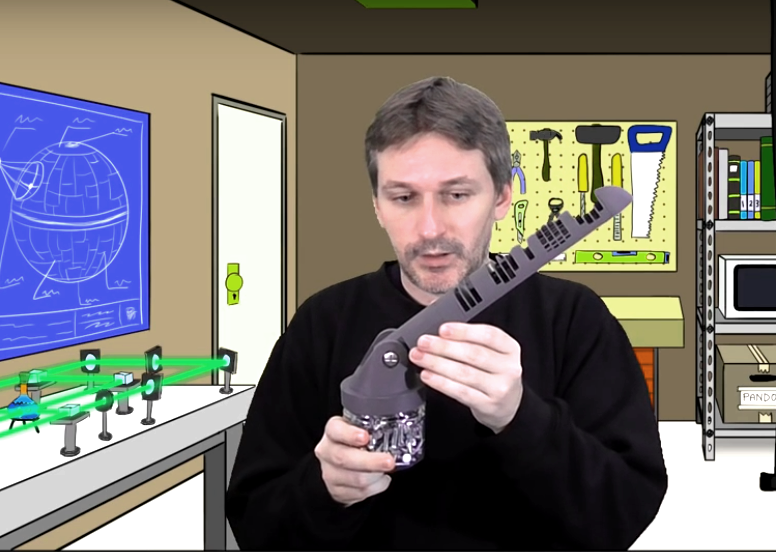 French inventor and maker of things Julien Coyne of Mojoptix has created an intriguing digital sundial gnomon that can be 3D printed. 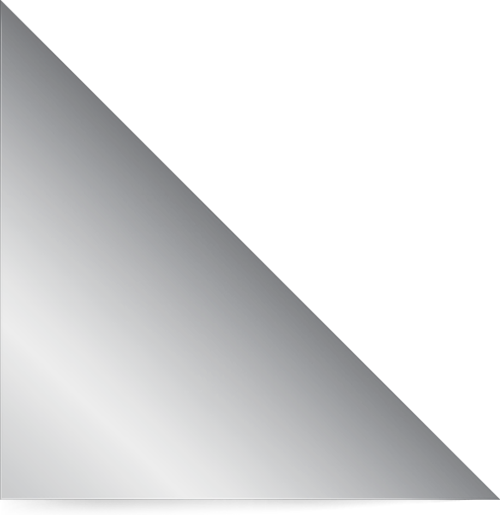 His software design (dated 13 October 2015) uses the 3D open software OpenSCAD described as "The Programmers Solid 3D Computer Aided Design Modeller".[http://www.openscad.org/about.html]. The North American Sundial Society likes to record public sundials that are in good or excellent condition. Dial #797 in Cranford, New Jersey is a sad exception. 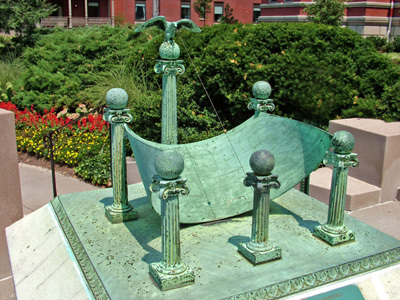 In 1972 the Kiwanis Club of Cranford presented a 15-foot diameter sundial to Union College as an expression of interest in the college and the youth of Cranford. But the years have taken a toll where it sits adjacent to the William Miller Sperry Observatory. The dais stonework mortar has given way and the concrete dial face has deteriorated. A plan to restore the dial is underway. Dr. Stephen D. Nacco, of Union County College, Vice President, Administrative Services & Executive Assistant to the President set up a Sundial Fund under the Union County College Foundation, a 501(C ) 3 not-for-profit organization. Donations can be made online via the Web Site, http://www.uccfoundation.org/give.html with the donor selecting GIVE ONLINE NOW. Choose Donation Type "Other", and then put “Sundial” in the Additonal Comments Area as the reason for the donation. 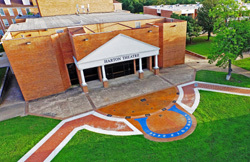 The large analemmatic sundial in front of the Harton Theater North Entrance of Southern Arkansas University (SAU) is being formally dedicated on Thursday, November 5th, 2016 in memory of the late David Thomas Smith, a 1957 SAU alum and retired assistant director of the SAU Physical Plant. The Smith Sundial, funded by family and friends of David Smith was built by the SAU Department of Art and Design and engineers of the SAU Physical Plant. Patrick Finney was the construction supervisor and Steven Ochs was the project concrete art designer and craftsman. As described in the NASS Sundial Registry, Dial #800 is "a 22 by 17 foot analemmatic dial of stained concrete with Arabic hour numerals of polished brass. The dial perimeter and hour numerals are set in a blue decorative polymer "U" arc, appearing as a large mule shoe that represents the university Muleriders mascot symbol. Dial colors represent the royal blue and gold school colors." 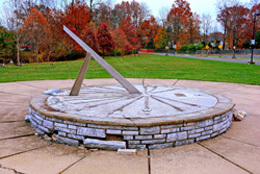 As reported by Southern Arkansas University, "The Smith Sundial at SAU is one of only four Arkansas sundials that are registered on the North American Sundial Society, and the only one outside of Little Rock and North Little Rock. 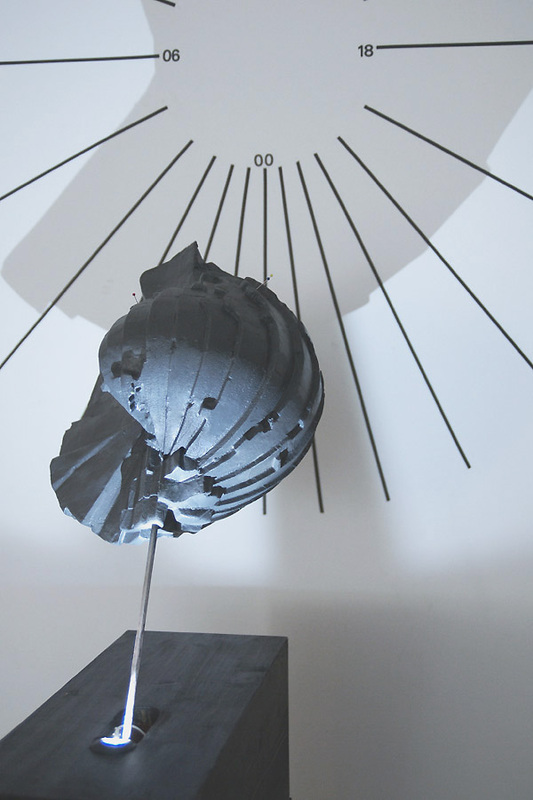 It is also the only sundial in the state that is [a monumental] analemmatic..."
Alisa Goikhman has put into art a sculpture called the Greenwich Globe. What started as a simple idea of dividing Canada and the US into time into time zones 15o wide (one hour steps), today's meridian boundaries create a complicated map. Goikhman projects this map onto a globe with the ragged ridges of each time zone, sequentially enlarging the meridians using the proportions of an Archimedes spiral. Goikhman explains: " The Greenwich Globe's shape was generated by an algorithm that treated time as physical matter. Each additional hour is represented through a constant degree of elevation and a 15o angle bend. The elevation based map projections gives easy-to-read shape to the complex man-made system of time-zones. It also operates as a sundial, a play on the now familiar row of world time clocks. The shadow it casts on a wall is meant to be read as a world watch. Each spike in the shadow shows the local time at a corresponding geographical region." 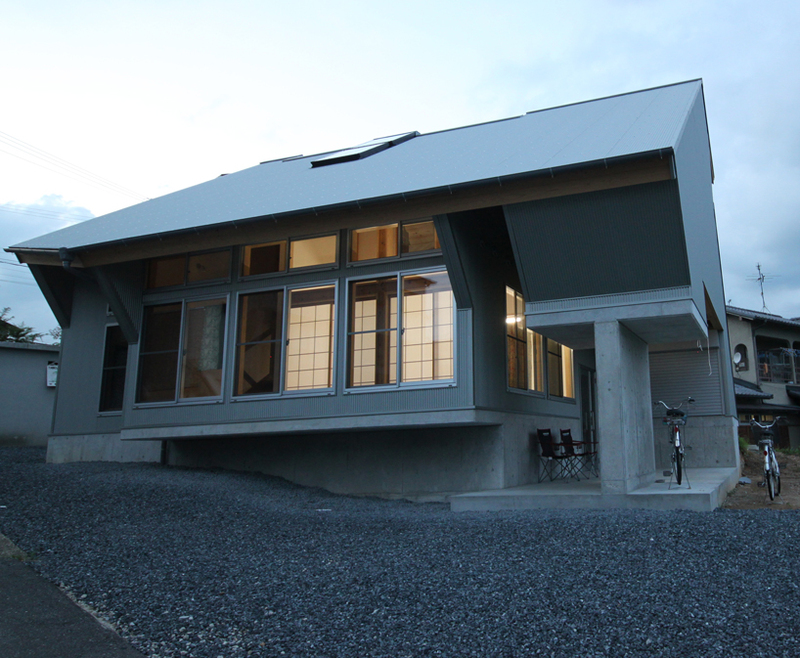 As reported in Design Bloom architect Kikuma Watanabe has designed a beautiful modern house integrating asundial and solar design principles: "The internal spaces support a comfortable environment where in summer it is naturally cool and in the winter it is warm. This ecological technology aids this passive system using the sun and the wind for an effective air conditioner." The interior of the house has two-story rooms and lots of natural wood. But unlike other houses except perhaps for the Cosmic Room in Corregadora, Mexico, it has a built in equatorial sundial. Central stairs lead up to the equatorial dial projection area with the gnomon itself a glass slit window in the roof. But the most important aspects for solar comfort are the angles of the eve overhangs, preventing hot summer sun from entering the windows yet allowing warming sunlight to enter during the winter . Brighter areas such as the kitchen are situated in rooms with southern exposure while the living room faces east looking out upon ponds and hills. Upstairs surrounding the equatorial dial projection ring are two rooms: the Room of Sunrise and the Room of Sunset, and on the main floor facing north is the Room of Shadow.